Valentina Pavlovna Guercken was born in Russia in 1901 and moved to the United States with her family during the Russian revolution. She became a pediatrician and in 1926 married R. Gordon Wasson in London. The following year, while on a honeymoon in the Catskill Mountains, Valentina came across mushrooms she recognized from her youth in Russia. It quickly became apparent that she and her new husband had very different feelings towards mushrooms. Together, they coined the terms "mycophobe" and "mycophile" to describe the difference. Over the next 30 years, the Wassons integrated mycological data with history, linguistics, comparative religion, mythology, art and archaeology, calling their field "ethnomycology". 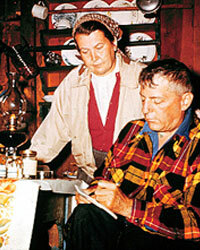 Beginning in 1953, R. Gordon travelled to Mexico to research the traditional use of mushrooms there. In 1955, shortly after R. Gordon, Valentina and her daughter participated in a magic mushroom ceremony of the Mazatec Indians. Her account of this experience was published in This Week on May 19, 1957 -- six days after her husband's famous piece was published in Life Magazine. In this article, Valentian becomes one of the first to suggest that psychedelic mushrooms might be used as a psychotherapeutic agent. She also co-authored the epic Mushrooms, Russia, and History with her husband later that year. Valentina died of cancer in 1958 at the age of 59.